Produced by Dobro master Randy Kohrs, and featuring Tim Crouch (fiddle), Josh Williams (guitar), Aaron Ramsey (mandolin), Scott Vestal (banjo) and Jay Weaver (bass). Jim Lauderdale is a household name in the Americana world as the annual host of The Americana Music Association awards show, host of Nashville’s weekly nationally syndicated radio show MUSIC CITY ROOTS, and co-host of THE BUDDY AND JIM SHOW (with Buddy Miller) on the internationally broadcasted SiriusXM Outlaw Country channel. Jim Lauderdale and Grateful Dead lyricist Robert Hunter have been longstanding, songwriting compadres, each award-winning writer acclaimed across multiple genres. 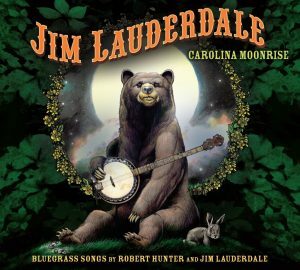 CAROLINA MOONRISE: BLUEGRASS SONGS BY ROBERT HUNTER AND JIM LAUDERDALE is their fourth collaboration and a logical follow-up to the 2011 GRAMMY nominated RHYME AND REASON. Sonically the album offers a fresh, contemporary take on traditional bluegrass. Produced by Dobro ace Randy Kohrs, this collection of 12 originals showcases Lauderdale’s distinctive vocals on tight bluegrass arrangements featuring a Nashville all-star band, including Tim Crouch on fiddle, Josh Williams on guitar, Aaron Ramsey on mandolin, Scott Vestal on banjo and Jay Weaver on bass. Jim Lauderdale is a multi-talented performer and songwriter, with success in both country and bluegrass music, and an international fan base. He is a two-time GRAMMY award winner, Americana Association award winner, and is among Nashville’s “A” list of songwriters. He is also the co-host of SiriusXM’s Buddy and Jim Show. His songs have been covered by Patty Loveless, George Jones, The Dixie Chicks, Solomon Burke, Vince Gill and George Strait. In addition to extensive touring as a solo artist he has also toured with some of the best in Americana, roots and bluegrass music, including Lucinda Williams, Mary Chapin Carpenter, Rhonda Vincent and Elvis Costello.